A 31-year-old man from Texas died after contracting flesh-eating bacteria through a new leg tattoo while swimming in the Gulf of Mexico. According to a paper published in the medical journal BMJ Case Reports, the patient – who was only identified as a Hispanic man – was admitted to Parkland Memorial Hospital in Dallas with severe pain in both legs and feet. He also had fever, chills, and a reddening over his tattoo and other areas of his skin. 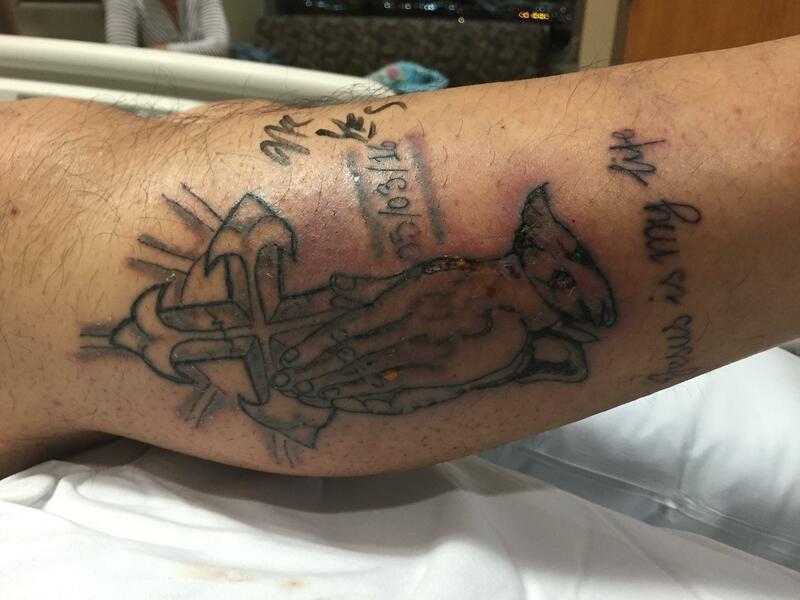 The man had gotten the tattoo on his calf of an illustration of a cross and hands in prayer with the words "Jesus is my life" written in cursive. Five days later, he decided to go for a swim. A cardinal rule of getting inked with a new tattoo is to keep it covered and clean and avoid soaking it in any type of water – including swimming. It's unclear from the report whether the patient was aware of these instructions. Three days after the swim, he went to the hospital complaining of severe pain and redness and irritation over and around his tattoo. "Within the first 12 to 24 hours his pain and discoloration in the leg advanced and developed what's called bullae or fluid-filled blisters," lead author Nicholas Hendren, M.D., an internal medicine resident at Parkland Health & Hospital System and UT Southwestern Medical Center, told CBS News. Doctors diagnosed the man with septic shock due to an infection with vibrio vulnificus, potentially deadly bacteria found in certain coastal waters that are present in higher concentrations in warmer months. According to the Centers for Disease Control and Prevention, vibrio causes 80,000 illnesses and 100 deaths each year in the United States. Most people become infected by eating raw seafood, particularly oysters, but exposing open wounds to brackish or salt water can also put a person at risk of infection. People with compromised immune systems, especially those with chronic liver disease, are more likely to get vibriosis. "What's often the case is that as the body is trying to fight the infection, the immune response is so strong that it actually begins to cause damage to other organs like the kidneys, the liver the heart and that can make you very sick, as well," Hendren said. According to the case report, the patient had a history of alcohol cirrhosis of the liver and drank six 12-ounce beers daily. Within 24 hours of admission, his condition declined with progressive septic shock and multi-organ system failure. Doctors put him on life support and treated him with aggressive antibiotics. Despite initial improvement, he continued to suffer complications related to cirrhosis, renal failure and necrotic skin lesions. He ultimately died two months after he was admitted to the hospital. Doctors say that most healthy people who contract vibrio won't end up in the hospital because their immune system is strong enough to fight it off. However, "all patients with chronic liver disease and haemochromatosis [excessive iron level in the body] should be instructed to avoid raw oyster ingestion and avoid swimming in seawater with open skin wounds," the report states. Additionally, anyone getting a tattoo should follow all care instructions closely to ensure safety. "For patients who get new tattoos, it's really important to listen to the recommendations," Hendren said. "Usually the tattoo parlors will provide clients with information about avoiding taking baths, avoiding swimming, definitely avoiding swimming in the ocean because that fresh wound is an entry way for bacteria, so keeping it clean is very important."